An aerial view of Hill End Hospital? | Cell Barnes | Out of Sight, Out of Mind? You are here: Home>Hospitals>Cell Barnes>An aerial view of Hill End Hospital? This photograph is one from the St Albans Museums collection, but has never been officially identified. We believe that it may be Hill End Hospital, but can anyone out there help us to identify the location of this photograph? Please add your comments if you can! This photograph was taken by Aerofilms Ltd. The entire Aerofilms collection was acquired by English Heritage and its partners, the Royal Commissions on the Ancient and Historical Monuments of Wales and Scotland, in 2007. They are embarking on a project to make the whole collection accessible. This page was added on 24/05/2010. It is definitely Cell Barnes hospital, rather than Hill End, identified by the tall square water tower centre right. My father, Fred Gregory, worked in the kitchens before the Second World War and after demobilisation as Sergeant in the Army Catering Corps returned to Cell Barnes becoming the Hospital Baker until the late 1960’s. We initially lived in a hospital house in Bisney Road (now Drakes Drive) and later moved to what is now 120 Hill End Lane. Lived in this area all my life & its always bugged me. Who flattened the field behind the rubber works. It was a lot of work with the high embankment. ??? I believe this to be an aerial pic of Cell Barnes hospital with the entrance from Hill End Lane/ Frobisher Road junction. The picture is very close to Hill End, but the plane was flying a little further south and moving westwards, towards the city. 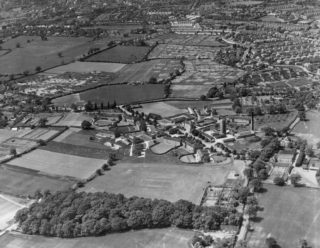 In the middle is Cell Barnes colony (as it was first known), with Highfield Lane and the farm (now demolished) to the right. Further back, and on the right, are the hospital houses on part of the former Beastney’s Farm. The double row of houses going left to right are a short road known as Bisney Road. Later, in the 1950s this became Drake’s Drive, and was extended fully the width of the picture to London Road, just above the parallel Hill End Lane. Camp Road can be seen snaking towards the city in the distance with the allotments to the left. The zigzag roof of the rubber works stands out near the top, and to the right of it you can just see Campfield Press (neither of these buildings extant). Cell Barnes Lane is the hedge-line shown diagonally in the top left of the picture, eventually meeting Hill End Lane out of shot. I think the picture was taken just after WW2. Cell Barnes was built c1933 and the grounds seemed to have matured, and the allotments were at their greatest extent during, and just after, WW2.